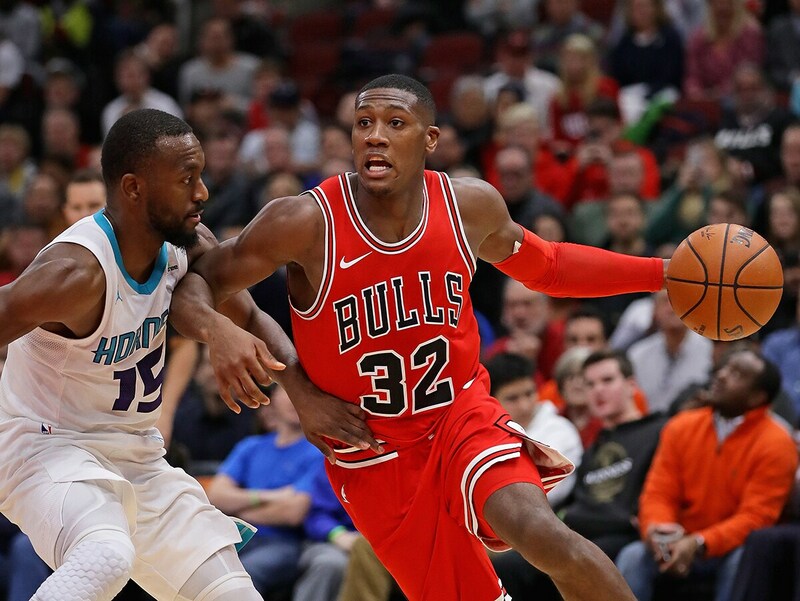 Could Dunn's Elite Defensive Abilities and Growing Offensive Skill Set Provide Bulls with Stability at the Point? This is when you know things are bad. When you don’t want your family to come watch you play. Actually, to watch you not play, which was mostly the job of much promoted rookie Kris Dunn last season in Minneapolis. Dunn was being hard on himself, he knew, much harder than his family was, of course. But he always held himself to that higher standard, and after being the top high school player in Connecticut, two-time Big East player of the year and the No. 5 overall pick in the 2016 NBA draft, his introduction to the NBA was a setback. But now starting for the Bulls, Dunn is beginning to get the point. The 6-4 guard is averaging 11.6 points, 4.6 rebounds, 4.4 assists and 2.1 steals, the latter ranking him fourth in the NBA. The last three games with a career high 24 points against Phoenix and a near game winner in Denver, Dunn is averaging 16.3 points and seven assists and shooting 58 percent and six of nine on threes. It’s that learning experience season the Bulls have talked so much about lately, especially coming after the last two losses, both by one point. The Bulls with eight straight losses and, at a league low 3-18, Monday host the streaking Cleveland Cavaliers, who have won 11 straight. 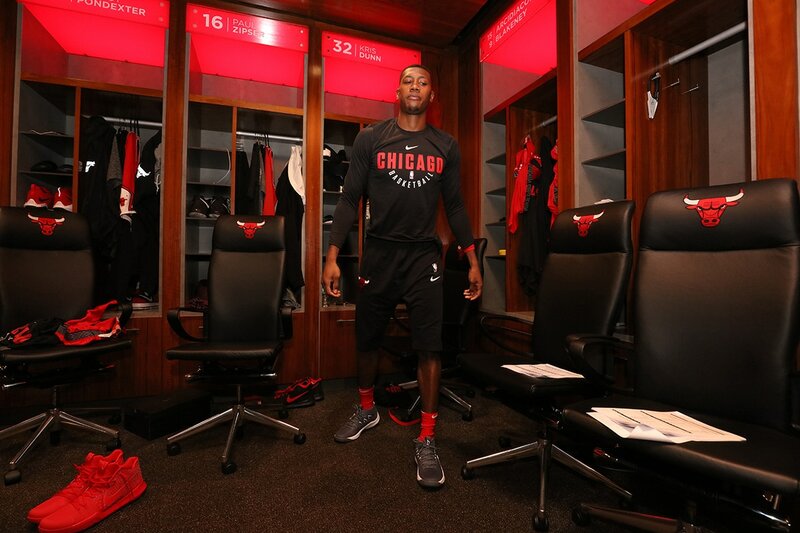 Dwayne Wade after one season with the Bulls and a contract buyout is now the team’s sixth man and averaging 11.4 points off the bench, fourth on the team. Derrick Rose was third averaging 14.3 points, but he left the team after an ankle injury amid reports he is assessing his future. Cleveland media has been reporting he remains in discussions with the team and conversations about a return have been positive. He would be out still because of the injury. Meanwhile, LeBron James continues to be a top MVP candidate. With Rose out, Wade to the bench and Isaiah Thomas, from the Kyrie Irving trade, not back yet after offseason surgery, James has taken on a greater scoring role. He is averaging 28.3 points, his most in eight years, and a career high equaling 8.7 assists per game. He also is shooting career bests overall and on threes. The Bulls hope to get Nikola Mirotic back this week, though coach Fred Hoiberg said likely not for Monday’s game. Mirotic has missed all season with facial injuries from a Bobby Portis punch before the season opener. Mirotic likely will play on the Indiana/Charlotte road trip later this week. Portis missed Friday’s loss to Sacramento with a sore shoulder. He was listed as probable for the Cavs. Which only puts a greater continued burden on the Bulls young players. But the team is beginning to see Dunn’s development. Dunn was part of the trade for Jimmy Butler that enabled the Bulls to pick Lauri Markkanen No. 7 in the June NBA draft and added Zach LaVine from the trade. LaVine remains out after knee surgery, but could return later this month. In many respects, Dunn is most crucial to the trade because of the importance of point guards in the NBA today and the difficulty of finding one. Since Rose’s 2012 playoff ACL injury, the Bulls’ point guard position has looked like a chorus line tryout: Nate Robinson, Kirk Hinrich, Marquis Teague, D.J. Augustin, Aaron Brooks, E’Twaun Moore, Rajon Rondo, Michael Carter-Williams, Jerian Grant, Cameron Payne, Isaiah Canaan, and Butler taking time there as well. Dunn with some aggressive play lately looks to be starting to fill that role. Sure, turnovers remain an issue, he’s not getting to the free throw line much and he can go from 19 points and nine of 11 against Denver to six points and two of nine the next night against the Kings. “The big thing with Kris is consistency, which we pretty much talk about with him every day, going out and being aggressive,” said Hoiberg. And Dunn is starting to show with the playing time and responsibility he’s capable of big things, like his closing drive that could have/should have won the Denver game and his defense among the league leaders already. We assume professionals are just supposed to perform, almost like robots. But they face many of the same uncertainties everyone does. Dunn did last season, and it’s been a slow process to heal. But he has been and the Bulls are starting to feel better. Sorry, we’re not letting that one go yet, especially as Dunn and his teammates were envisioning it: A young, athletic core of Dunn, LaVine, Andrew Wiggins and Karl-Anthony Towns. They figured to develop and star together. LaVine’s injury ended that. With LaVine out at least half of this season, Timberwolves president Tom Thibodeau decided he couldn’t wait and made the trade for Butler. Minnesota with a solid start is in position to make the playoffs for the first time since 2004. Thibodeau also couldn’t wait for Dunn even as the Timberwolves traded Ricky Rubio. The Timberwolves then signed Indiana point guard Jeff Teague. Thibodeau isn’t a coach who likes to watch rookie mistakes. Sorry, there was no time for rookies. Dunn, 23, was the starter a few games early in the season, and then two late, starting seven games overall. Typical was his best run in March when he averaged 12.3 in three games and shot 57 percent. Then he played fewer than 10 minutes two of three games. So he tries to please the coach instead of just playing naturally. It didn’t work, and the Bulls hope they are the beneficiaries. Dunn says he doesn’t try to be anyone in particular, but he likens himself in some ways to Rondo. Good defense, penetration, some pugnacity. 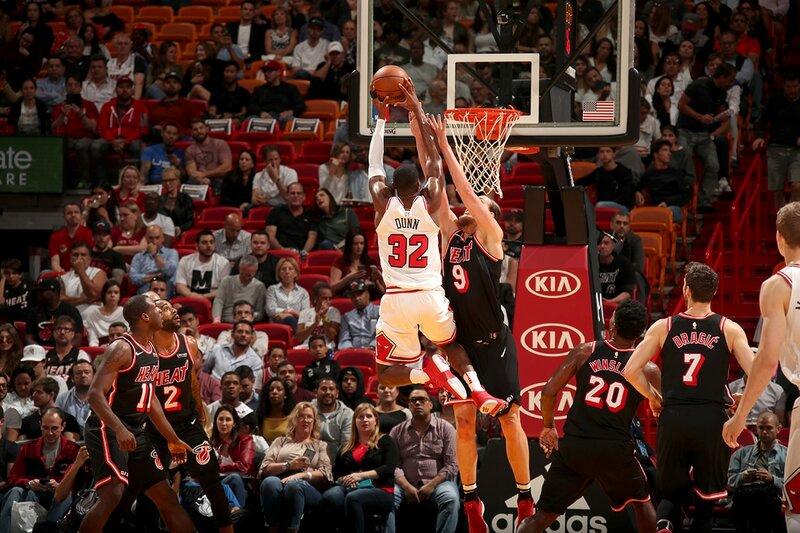 The Bulls are starting to like what they see in Kris Dunn.